(It’s been several years since we discussed the impact of the U-District’s Alcohol Impact Area designation on Wallingford. As a refresher, in 2006 the city declared the University District an AIA, which meant that stores in that area are forbidden from selling 29 different types of fortified wine, beer and malt beverages favored by alcoholics for their high alcohol-to-cost ratio (e.g., Steel Reserve, Colt 45, Night Train Express). Unfortunately, this has meant that those spending their time in the U-District (or around the highway ramps at 45th St and 50th St) need only stumble towards the 7-Eleven or the 50th Street Market in Wallingford to sate their thirst. My name is Lisa De Alva and I moved to Wallingford in 1997, when I bought a house near 50th and Thackeray. I and my housemates enjoyed living in such a friendly, walkable and safe neighborhood. The tenor of the area began to change several years later when neighbors began to report some property crimes: a car was stolen from in front of a home on Thackeray and we discovered 47th between Thackeray and Latona was a “parking spot” for working girls to ply their trade. We also started having some issues with the occasional drunks using our properties for hangout spots after having frequented the 7-Elevent or the 50th Street Market. We were all instructed to call 911 whenever this would happen, which we did, but two guys took exception to that and set my car on fire. This was observed at around 5 a.m. one October morning as my neighbor across the street was heading to work. What on earth had changed? 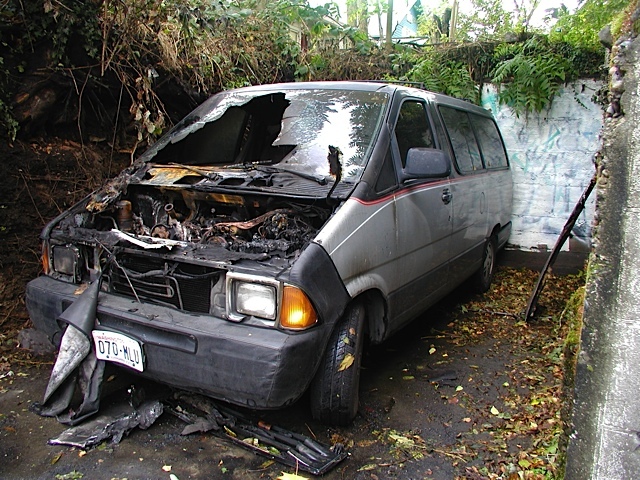 The situation got even worse in 2006 when the city implemented an Alcohol Impact Area in the U-District, in order to prevent the chronic public inebriation that was present in that area and in an effort to clean up the Ave in particular. Unfortunately, the AIA’s boundaries were 60th/Ravenna to the north, 15th to the east, Northlake/Pacific to the south and Latona to the west. I have never been able to find anyone to take responsibility for these designations, but it slays me that the western boundary borders an elementary school and is a mere two blocks from the 7-Elevent and the 50th Street Market! 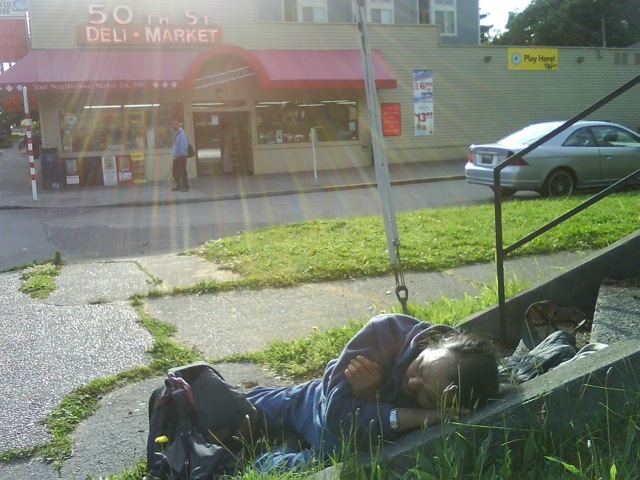 What has happened in the intervening years is that the U-District’s street drunk problem became ours. We have had a veritable “drunk highway” up 50th from the freeway where the street drunks panhandle at the exit, then take their profits and spend them at these two markets. We started trying to get something done about this in 2008/2009, but to no effect. A very pleasant surprise occurred in 2010 when Mr. Henry Ong of the 7-Eleven agreed to stop selling fortified alcohol if the 50th Street Market would also stop. Conversations with the Changs, the newest owners of the 50th Street Market, didn’t get any results. Representatives of the City (including Tim Burgess) came and walked the neighborhood to observe what was happening. We were told to coordinate with a Tim Durkan who was the Lake Union District Coordinator for the city. He was very sympathetic, but couldn’t do anything. We tried enacting a Good Neighbor Agreement, but that was a non-starter, too. We polled the neighborhood to find out what sorts of grocery items everyone would purchase on a regular basis if they were available at the 50th Street Market and presented the list to the owners, but apparently the fortified alcohol, statues of cobras and “Scarface” posters make them more profit. Frustration was mounting and we were all getting tired of the situation. You can only clean up vomit, feces, urine, blood, trash, used syringes and booze cans for so long. And when these people take up residence on your stairs or physically attack each other or shoot-up drugs or pass out in your yard or intimidate you so that you are afraid to enter your own property, enough is enough. I’ve been having trouble trying to find out who we could appeal to to get the western boundary of the U-District AIA moved further west, beyond the retailers of the fortified alcohol, but whether it was the Washington State Liquor Control Board or if it’s the city was still a bit of a mystery. Each entity refers to the other in this matter. A few weeks ago, I went down to the mayor’s office to try and get someone, ANYONE, to help. I kept getting brushed off by the receptionist, so I got louder and upped the volume until someone came out to shut me up. Within five minutes, Mr. Darryl Smith, Deputy Mayor of Community, appeared with an assistant in tow. I explained our situation and he said he was aware there was a lot of unhappiness with several current AIA situations and he promised to look into it and get back to me. I received an e-mail shortly thereafter from Mr. Smith’s executive assistant, Julie Salinas, in which she said they were working on gathering information on how we could get the western boundary of the AIA expanded. I next heard about six weeks later in which she attached some information that indicated the Liquor Control Board sets the boundaries and must approve the ordinance to expand and that the Seattle City Council needs to approve the ordinance to expand. First, the LCB would need evidence presented to demonstrate why the boundary needs to be expanded. Then, I made the acquaintance of Lisa Uemoto through an SPD officer and also through a LCB officer. Ms. Uemoto used to be involved in with neighborhood business and AIA-related issues and she sent me a couple attachments with good information about the AIA. She also told me now is a good time to deal with this as Beacon Hill is inthe process of adding yet another AIA and that Lake City was being proactive about this, as well. As luck would have it, a news article from the P.I. on April 3rdn detailed Lake City’s actions regarding their public inebriate problem and Darryl Smith even made an appearance at a public gathering there in support. Neighbors in my part of Wallingford have been documenting this problem for the last several years , but we haven’t really gotten any action yet. I was curious how other parts of Wallingford were dealing with this situation and what their input might be regarding an expansion of the Western boundary. Also, with the new liquor law going into effect, how do you think that will affect us all? Expanding the AIA merely pushes the problem to another neighborhood. The western AIA boundary is the same on 40th and 45th Streets, but these problems aren’t nearly as bad there as they are around 50th. A big reason why public inebriates congregate around 50th is that the street is pedestrian unfriendly to the average person. If sidewalks were widened, traffic flow was calmed and crosswalks were installed, more neighbors would walk that corridor at any given time, providing “eyes on the street” which inherently discourages unsavory acts like public urination, open drug use, etc. Your best bet to reduce public nuisances in that area would be to write the mayor and SDOT and encourage them to consider a “road diet” on 50th. You have done a lot of work. Wallingford Community Council and neighborhood group. Get Good Shepherd admin involved somehow.. if only to get records of violence, trash etc.. The Pea Patch has some long time gardeners who may have evidence or other reports. Have those who burned your car left or remained? Is it time to start calling 911 again? how about parking enforcement to get cars removed or ticketed for parking violations? Block Watches, walkign the neighborhood put you in visibility but make more eyes present.. and its several different groups.. the 7-11 drinkers.. different than drug dealers and ladies. I like Doug’s “road diet” idea. I haven’t ever advocated to the city for anything, but I’ve done my share of advocating to SPS for my special needs student. One thing I’ve learned is that “they” move a lot quicker if you advocate for a solution that echoes “their” agenda and works for both of you. The mayor is already behind the “road diet” thing, so you might be more likely to get his attention with that spin. It also helps if you present yourself as an ally. Believe me, there have been plenty of times when I wanted to yell and verbally knock heads together, but it gets you absolutely nowhere. Despite bureaucratic inefficiencies, these are people who are truly dedicated, work extremely hard just getting through their day and balancing equally valid but competing interests, and are up against some huge challenges. In some cases, they really turn off if they feel criticized. I try to approach them with a “Hey, I’d like to help you guys out” tone. Empathize. Play “good cop.” Get them to feel comfortable with you. It really, truly makes a difference. Be as angry as you deserve to be on the inside, vent about it to friends and family and to your community. But I’ve learned when you’re talking to someone in power (at least with the school district…the city might be different), you get your foot in the door a lot quicker by staying within the lines. Hope any of that is helpful. It sounds incredibly frustrating. Good luck to you! The people who panhandle at 50th and the I-5 exit/entrances take turns soliciting handouts while the others sit in lawn chairs in the shade and openly consume their malt liquors. The fencing in that area needs to be brought out to the sidewalk and the trees pruned back to eliminate their hiding place. 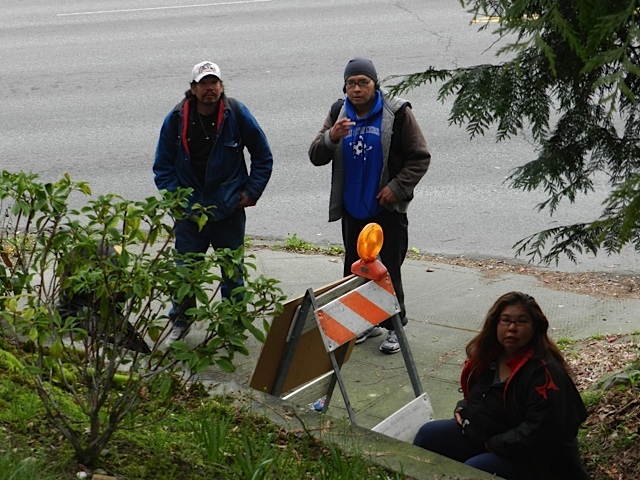 Seattle Police and State Patrol need to stop ignoring this activity – regular police presence at this trouble spot will cut down on the illegal conduct and the panhandling which facilitates this public drunkeness and related activities. BTW: In a moment of lucidity and candor, one of the Wallingford inebriate street people told me that most of the items they “find”/steal are taken to a “woman” living in the U-District who trades them alcohol and/or drugs for their ill-gotten goods. The winners of the liquor store auction will be announced today. June1st is the day of the transition- I think QFC can start selling alcohol then. I’m not sure about the new liquor law effect on Wallingford’s population of alcoholics. I guess their ability to get money from people on the off ramp is what’s most important to them. Thanks for the update and for sticking it out in the neighborhood / with the city government. Wallingford as a whole needs AIA status, what with the issues outside QFC, in Meridian Playground, and at I-5. More generally, why not ban fortified alcohol from all of Seattle? I can’t imagine it brings a lot of happiness to any neighborhood. Regarding road diets, the rule for those is they can’t lower throughput. They are designed to calm traffic. As 50th is clearly saturated there definitely won’t be a road diet there. 50th already had a road diet (up to 2nd NE) a few years ago. I agree with Vegetarian that the real answer is to ban fortified alcohol citywide. I do agree with others that the AIAs do just push problems elsewhere but as a resident of the area that the problem was pushed into I think we need to extend the AIA or end it and extending it sounds more likely to be successful. Maybe if we can increase the distance between the freeway and fortified alcohol we can decrease both panhandling at the freeway ramps and public inebriation in Wallingford? I would also agree with Mike’s point that increased fencing along the freeway offramp at 50th might also help. I was headed east on 50th this morning towards the freeway and saw the regular morning ritual of a few folks trudging up towards the 7-11 or the 50th Street Market along with another bunch sitting on a wall closer to the freeway. They used to hang out in the laundromat at 50th and 1st until that closed (not sure if it’s reopened again). Apparently key point on the geography – if the freeway ramps play a major part in revenue, then they’re the center of the shopping area. A district-oriented approach to the problem might be convenient for various institutional reasons, but since freeways typically occur at district boundaries, policies either need to include districts on both sides of the freeway, or find some other way to draw boundaries. A more walkable N 50th would be nice, but I’m not holding my breath. Even with the city on board in principle, they’re going to pick their battles, and 50th looks like the highest volume east-west vehicular route in these parts, with few pedestrian destinations and a stiff hill (sounds like the drunks might be getting more healthful cardiovascular exercise than most of us do.) And modest improvements in walkability could be great, and still leave you a long way from solving the troubles shown in those photos. From an economic point of view, the injured party in this is the real estate owner in this area. If the prospect of drunks sleeping on your doorstep knocks a mere $100K off average sale price, you’re looking at millions in collective loss. Owners may be thinking the problem will go away by the time they’re ready to sell, or may be thinking buyers will be unaware of the problem. Photo documentation like this is a great way to get local owners to face the deterioration of their neighborhood while there’s still a chance to turn it around. As Dennis notes, there has been a road diet on 50th. However, this road diet focused only on shifting lanes around. The pedestrian safety issue there was not addressed as part of it. Sidewalks are narrow, next to the lane of traffic, and in some cases overgrown. That begin said, I believe that it’s going to take more than “eyes on the street” to address the inebriation issue. Expanding the AIA, or better yet, getting rid of all fortified alcohol, would go a long way. I manage property a block off of broadway and as you can imagine I deal with an extraodinary amount of foot traffic and street people. I make myself visible a majority of the day and although this has helped it will not completely solve your problem. These people are drunk and don’t give a damn. I have gone down many avenues trying to deal with this same situation and the only one that seems to stick, is brute force. Now, this is not everyone’s cup of tea and the police don’t recommend you dealing with this yourself but, you have been more than patient and have exhausted every civilized and correct way of dealing with your problem with no reward. Our neighborhood became unified when a few of us started standing up to these vagrants and they took notice. I have had knives, baseball bats, and bike chains pulled out on me and you should be wary of how unstable this crowd is. There is still some weekly trouble to deal with but, this is to be expected in my location. You should have very few problems after “ringing the necks” of a few of these trouble makers. I didn’t serve this country so non-tax paying bums can do as they please. I do realize alot of these street people are veterans but, they are not the majority and I always help the ones who have helped this country. Drunks & dopers will satisfy their habits no matter the cost. Higher priced booze just creates a higher tax revenue for the State & crime for us. Moving the AIA line is just a NIMBY answer to the problem, without dealing with the issue. Pan handling to vehicle traffic should be illegal because of the safety issues. Alcohol related laws need to be enforced. Why create more laws that won’t be enforced? I was corrected a while back that 50th st. has never had a “road diet”, but just a traffic revision. And by doing so put more traffic onto the side streets and created a 50th st. parking lot, all in the name of safety and improved traffic flow. Cutting back the sidewalk overgrowth at the homeowners expense and removing other obstacles on city sidewalks would go a long ways to a safer and more enjoyable pedestrian thoroughfare. After all, the sidewalks do belong to the tax payers and not the homeowners. I greatly appreciate Lisa’s work on this continuing problem. There seems to be a new group of the “sodden brotherhood” that have shown up in the last couple weeks. They seem to be louder and lounge around more. I like the idea of banning the fortified drinks citywide. What can we do to get that done? 50th street is the major east-west corridor in this area. I don’t see how we can widen the walkways without making it more unsafe for everyone. The middle left-turn lane has helps keep traffic not getting hung up by one left turning driver. There really should be no parking allowed on 50th street between I-5 and Stone (it gets ridiculous on nice weekends because of one or two parked cars on the west bound lane), but that is another item. I vote for a city ban on fortified drinks and changing the fencing by the freeway to limit “camp-ability.” The bushes, etc. can still be there, but on the freeway side of the fence. Good conversation on this drunken topic! 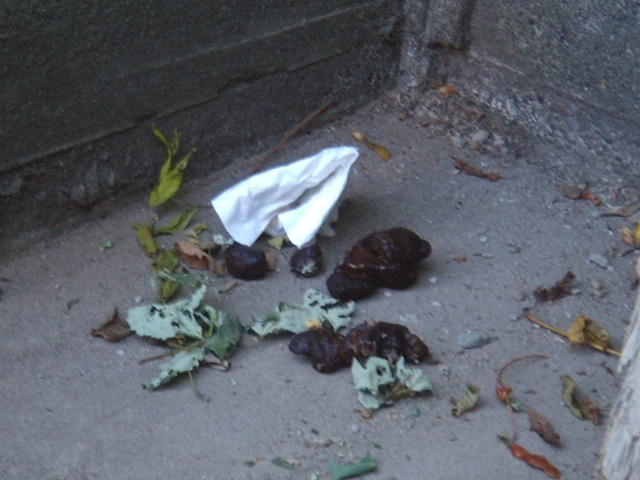 Just a quick comment on banning fortified alcohol: Removing it seems to have the unintended consequence of producing more vomit all over the sidewalk. A friend was part of an AIA study several years ago and discovered that when there was no fortified alcohol, people with alcohol addictions drank more of the non-fortified stuff to get the same effect. Drinking that much more alcohol by quantity seemed to make people puke more. I guess it was just a matter of more liquid sloshing around in the stomach. Anyway, I feel for the people who have to deal with this discouraging and frustrating problem. There is an answer somewhere. If any community could find it, it’s this one. Why not go to the media? See if King 5 or the PI want to do a report on this struggle. How about a boycott of the 7-11 and Market? Does shame have any effect on the owners? I’m afraid pushing the boundary to Wallingford Ave or Stone Way will move the party to my block. Sorry, but that’s what most people are probably thinking. I wish they could just sell booze from a stand in the highway median. We are new to the area and quickly noticed the gathering of drunks on the the corner of 1-5/50th. They now have a couch to lounge out on while drinking openly. I have two young children and I refuse to even walk down 50th. I’ve been harassed while returning a video at 7-11. What’s the deal with that laundry place anyways? Is it even open? It truly is disturbing and sad. I’m definitely am on board to write our government. Regarding hard liquor consumption: Most drunks stick to Malt Liquor and Beer. This is true in “normal” states too, like California. QFC adding hard liquor isn’t going to change their consumption habits or routes. You won’t see the drunks follow the boundary west, if 1) it’s too far from their couch at the freeway exit, and 2) there aren’t any convenience stores there selling malt liquor. The present boundary fails on both counts. If it moved to Meridian, that would be about the same 1/2 mile as from the freeway to 15th NE at the east edge of the commercial U district. Not that I’m saying this ban is a totally workable idea, just that it creates an obvious problem when implemented on one side of the freeway and not the other. What they’ll do if that’s fixed, is anybody’s guess. Another approach would be to find some U district retailers that hate the ban and help them get it repealed – neighborhood residents on their side would give them valuable leverage, and that in turn would probably get the boundary change idea more attention. Win either way. I don’t live in the part of Wallingford that is affected by this problem, but it sounds like the heart of the issue is that people addicted to alcohol can receive money easily and without much effort at the freeway off-ramp. Maybe the solution is to shut down the access to easy money at the off-ramp. A group of neighbors stationed at the off-ramp with signs advertising the damage of chronic inebriation to the community might make someone think twice about giving to a panhandler. Maybe the group of neighbors could take donations for Familyworks instead. The encampment and lounge area of the panhandling drunks at I-5 and 50th caused us to become non-walkers when heading from Wallingford to the U-District (Farmer’s Market, for example). This makes me sad, but my kid was frightened, and I was not comfortable either. Why is it legal for these guys to be (a) living in those bushes (b) hanging out all day (loitering) at the exit? Does nobody in our city government or law enforcement care? It’s been clear to me over the past 7 years that vandalism and property crime in the Wallingford area has gotten steadily worse. People blamed it on the high school students who were for a time housed at Lincoln H.S., but they’re all gone now, and the problem remains. I agree with those who are saying a boundary change will just push the problem further into someone else’s neighborhood. And I agree that getting media involved may at least embarrass the current administration into some sort of action. I think making sure that 7/11 or 5oth street market dont sell to inebriated folks would be more effective than standing at the freeway. Although cutting off their income stream certainly has appeal. My wife and I picked up trash on 50th from Wallingford to I5 last Saturday. Most of the areas along 50th had minimal trash except for the sections from the laundromat on 1st and 50th to Latona and 50th, where we found at least 18 beer, malt liquor, and energy drink cans, along with what looked to be aerosol inhalant containers. I will forward this information along with my request to expand the AIA westward. Even if some of us are major customers, which I doubt, a quiet boycott isn’t going to faze them. It’s going to have to be the kind where people are outside day and night, carrying signs and yelling at customers, like back in the day when the grocery clerks went on strike. If you guys have the hair to pull that off, it might get quick results. Picket in front of the Chang’s home? a. I get the sense that you are one of very few in your neighborhood who care about what is happening there. First step is that people have to get to know and like each other. Try to find some interest in having a small “Seattle Night Out” block party. b. It seems that a central feature of the bum community in your area is the 50th street on-ramp to I-5. They need to be deprived of this resource. Get permission from the appropriate agency to do some highway clean-up at the on-ramp, Arrange to have a couple North Precinct SPD officers on site to deal with any possible protestations from the bums. Cut their tree to the ground and weed-wack the remaining greenery to a nice four-inch height. You wouldn’t want to “nuke” the area with Round-Up (herbacide) or Casoron (soil sterilant) unless you were desperate. take the cut-down tree and the bum furniture to the dump. c. Vote for people who are interested in defending YOUR rights. d. Join the NRA and learn how to use a gun to defend the lives of yourself and your family members from inebriated sociopathic bums. Oh, one more thing – from what you said, the fellow at the 7-Eleven was more sympathetic than the folks at the 50th Street Market – so why would you boycott the 7-Eleven? btw.. a few 2? years ago there was practically a homeless shelter at 45th overpass ogf I-5. There were chairs, large bushes.. lots of scattered junk. I recall seeing police a few days in a row ans in a few weeks the entire ‘settlement’ was gone. Now the trees ans bushes are very sparse and almost no on ehanging around. The city had to be involved.. for police to come.. one time 4 or 5 cars. a. I know the folks on 1st Ave NE have started to have a lot more interest in their block watch as a result of this issue. We have met with the SPD already to explore our options. Yesterday, several of us went out to clean up the area by the laundromat, including cutting back vegetation, removing bottles/cans, etc. b. The encampments on I-5 were brought up to SPD at the block watch meeting. The SPD representative explicitly told us that clearing out encampments on highway right-of-way was not a high priority. This was not exactly the answer many of us were expecting. I agree that dealing with the pan handling at the off ramp seems like a more sustainable solution. Is it illegal already? If so, what about some high hard to reach signs on the off ramp saying as so much? See something illegal? Keep calling SPD. Even if it seems like nothing happens. SPD determines patrols based on the number of 911 calls. Can’t imagine how frustrating all his must be. Good luck to you all. 1) I believe Issaquah a year or two ago made it illegal to bum change on the off-ramps, citing safety issues. Why can’t we do that in the AIA, or even for the whole city of Seattle? Now, I realize that Seattle’s a lot bigger than Issaquah and so maybe it would be more difficult to enforce, but it’s worth talking to the City Council about it. And we shouldn’t just criminalize the activity bumming money at the off-ramps. We need to ticket the idiot do-gooders who GIVE them the money. Make it work like the new law on driving while texting, perhaps. The city needs money, after all. I don’t know who pisses me off more, the bums at the offramps, or their enablers who hit the brakes on a green light just to give them money to go buy a 40. For one thing, the bums and their enablers make the people behind them who have actual responsibilities miss the light, and possibly be late for whatever appointments they may have. I’ve also had some close calls almost rear-ending their cars, and guess who pays the ticket in a rear end collision? 2) We need to get rid of the bum’s “living room” one of these nights when they’re not around. I’d haul away the couch in my truck, but I don’t want to have to fumigate my truck and and wear a hazmat suit. On the other hand, maybe someone with an axe or a battery powered reciprocating saw could just cut up their couch in leave it in place. That would take away their comfortable hang out, and send a message that we’re tired of accommodating them. 3) Lastly, and maybe I’m crossing the line here, why waste time picketing the Chang’s home? It would be so much quicker and easier to do a “bottle return” to their front lawn, say every week. 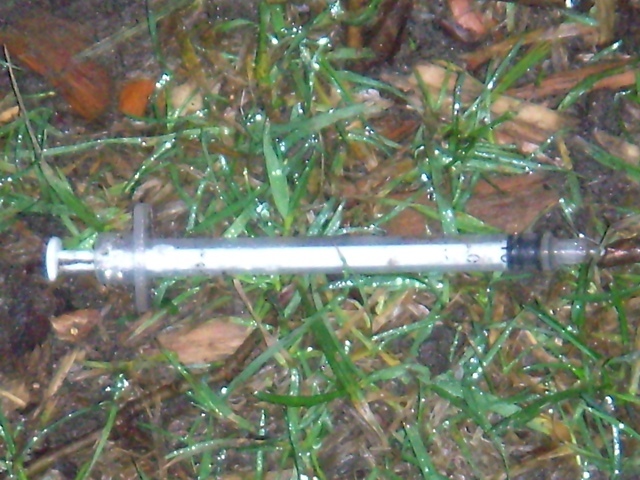 Whoever is forced to collect the empties, syringes, and all the other “presents” left behind by the bums should dump it all on their lawn, with a note saying it’s from their “customers.” Let the Changs get a taste of what it’s like for the homeowners who suffer the results of their liquor sales. Maybe then they’ll reconsider selling the stuff. 1.) for the girlfriend.. it may be time to get landlord involved.. and also to find out who owns the vacant home and inform him. Personally I would move. Drunk people have little to lose and dotn know or follow the las. I would be too afraid to stay. 2.) If not the Changs home, how about piled in front of their store door? 3. Having the police once every two weeks hike the trail at the NE corner of 50th and I-5. Those will take 2 or more years to implement. Do you understand what the problem is? They’re responsive to your requests, maybe you could ask them to stop selling fortified alcohol. If the situation is as portrayed in the article, and they won’t stop, how can you call them `responsive community-minded people’? Something doesn’t add up – maybe we don’t have the whole story? the problem would go away? thank you Linda. The problem will nto go away and if they just STOP one day they will probably get graffitti etc.. However another thought is to ask them to limit the hours of sales.. say from ONLY noon to 8 PM.. it isnt perfect but it may nudge some people from using this as a source all hours and maybe nudge them to unrestrictes sales. Its a BIG problem with ramificatins from angry lawless people. Linda I’m not buying it. They might be nice folks but they’re also making a profit off of selling products that have an impact on the whole neighborhood (not to mention slowing killing the people who buy them). By not selling fortified alcohol they would be removing a reason for folks to travel into the neighborhood to buy it – which is the specific problem we’re talking about here. No one should vandalize property. Everyone should pick up their own litter, ‘bum’ or not. What we’re seeing are symptoms. Is the ‘Ten-Year Plan to End Homelessness in King County’ on track? Think you might want a drink if YOU were homeless? Do you drink in the comfort of your own home? Do you ever look to sky and notice the chemtrails? Have you ever heard of H.A.A.R.P. or the agency that runs this program, D.A.R.P.A.? Symptoms, lots of symptoms everywhere. Six Degrees of Separation of people, problems as well. No one’s going to think it through and come to your conclusion, because it doesn’t add up. They’re drawing drunks to the store because it’s profit for them. Please explain why they are helpless victims and not able to stop this. The store contributes to the problem because they sell fortified alcoholic beverages that attract the folks from the freeway. If they didn’t sell those beverages those folks would go elsewhere. If the store owners are impacted it is based on their own decision to see those beverages that attract that clientele. It is completely voluntary on their part. I agree with you, Linda Kager, thank you Coolio, and thank you Linda! Please Wallingford community, the world for that matter, LOOK AT THE BIG PICTURE! What if the 50th Street Deli Market and the 7-11 agreed to stop selling the fortified alcoholic beverages for the month of May AND our community committed to purchasing selected products there during the month. Both stores could post a menu of choices and customers would mention Let’s Rock Wallingford or something when purchasing. Call it a startle mechanism that will upset the established patterns described above. AND in that disrupted period, work to find the resources and city ears to make a difference. The Metro bus shelter at 50th and Thackeray Place NE was removed recently at organized neighbor’s request, slow and steady wins the race. For what it’s worth, here was my attempt to get government to address the I-5/50th St problem….don’t feel like my property taxes are being used very efficiently. Thanks for your email below. I see the couch is now gone, but now there is a mattress there as of today. The futon is still there on the corner of the Northbound exit from I-5. There is at least 5 homeless drunks/drug induced people there on the corner every time I drive by and they are walking to and from 7-11 on 50th Street to purchase fortified alcohol in the evenings around 5-6pm when I get home from work. What is our recourse when there is such drunk and disorderly conduct routinelly comes into our neighborhood? It’s not the people who live here. Should I call the police every time I see a drunk guy passed out on Thackeray? This group also harrasses people walking by and doesn’t make me feel very safe walking to the UDistrict after work or early in the mornings. Your comments to the City of Seattle were forwarded to us as we maintain State Highways including I-5 in Seattle. Your comments are similar to many others we have received for multiple locations in Seattle. To give you a background on our garbage cleanup efforts related to homeless on I-5 in Seattle, during our last biennium we spent $430,000 cleaning up homeless camps, and in this fiscal year which began in July we have so far spent $139,000. These costs do not include the damaged and destroyed fencing, barriers and graffiti issues, they only include removing hazardous waste, garbage and human waste. Because of input from the public, we post all camps at least 72 hours prior to any cleanups and we are required to look for, identify and hold in inventory, any items found during our cleanup efforts that may be deemed personal or valuable. We have a regular cycle of areas throughout the I-5 corridor that we clean on a weekly rotational basis and the 45th/50th St. ramps are part of this. It’s important to note that our crews have no law enforcement powers, and as such we have no legal authority to remove illegal encampments from our right-of-way or arrest people for using drugs. We rely on Seattle Police and at times the State Patrol to enforce trespassing laws. So for a typical cleanup we post the notices, return in 3 days to perform the cleanup, upon arrival the occupants then gather up their belongings and walk away for a little while, then return once the garbage is removed. The location you give is not quite the usual one for that area, but as I drive through there quite often I will take a look and make sure the supervisor gets it placed on the list for clean up. The homeless camping, sleeping and openly doing drugs and drinking alcohol on the freeway side of the NB offramp to NE 50th Street is really getting out of hand. There are about 15 people and several tents and a futon. The City of Seattle, Customer Service Bureau (CSB) received an inquiry or concern that falls under the jurisdiction of your department or organization. Please see below for details. The customer has been notified of your role in responding to the request. Your follow up is much appreciated. Another example that punctuates the shortage of 75-100 police officers in Seattle. This sort of “nuisance” starts out as a low-priority crime (like shoplifting, etc.) then escalates into the chronic spreading disease we now see. Short term solution – better and more enforcement from SPD; long-term solution – Seattle Mayor & City Council stop kow-towing to real estate interests that desire low-crime reporting stats and start protecting the tax paying citizens. I, like many of our neighbors here in Wallingford, drink in my own home. The difference is, WE DON’T DUMP OUR EMPTIES ON PUBLIC PROPERTY AND PEOPLE’S FRONT LAWNS. This is part of the reason why people are fed up and angry with the overpopulation of bums here. being homeless doesn’t give them any more right to litter and be a nuisance than the rest of us. But by all means, if you think it’s fine for vagrants to spend their money on drink or drugs instead of for a roof over their heads, fine. Volunteer to clean up their encampments on the off-ramps, or invite them to toss their empties onto YOUR property. Hayduke, The first thing I pointed out was ‘No one should vandalize property, everyone should pick up their own litter, ‘bum’ or not.’ I did however make a mistake in implying I agreed with Coolio, it was Linda’s remark. Sorry Coolio. I don’t have the answer, I just try to see all sides. Blind Men and an Elephant. Mike, I’m not sure how this relates, but maybe you’re on to something. This ‘chronic spreading disease’ you speak of, is it called Morgellons? Does it occur to any of you that if you patronized the 50th Street Market, actually spent money there, that they might be willing to stop selling the stuff that the homeless people buy? Somehow they have to make a living. Without the support of neighbors, they have to rely on the homeless in order to survive. Have any of you ever considered a “Cash Mob” there? It might encourage neighbors to shop at the market, therby eliminating their need to rely upon the purchases of the homeless in order to stay in business. Personally, I found that they have an excellent wine selection, and the prices are lower than the big chains. Their deli food also looks delicious. Give them a try. @Native, did you read post 48.? I can think of a long list of items I take a bus or ride in a car to procure that I would walk to both venues to purchase. Let’s say the trial month worked on several levels – this also seems like a long-term approach to one aspect of this urban challenge. My Husband walked through The Good Shepard around 7am today and said everything was cleaned up and NO homeless sleeping there. Has something come of all this? I agree with Native. Thank you (as well as a couple others) for pointing out that there is another perspective here. I drove by that exit.. the trees and shrubs can conceal many. It may be time for many to call the Cithy and get trimming done.